Mount Juliet House is an architectural gem. Beyond the classical doorway of the main house, guests are drawn into an impressive entrance hall that pays tribute to 18th-century craftsmanship. Here the original features are complemented by a large mural, which celebrates the equine tradition and heritage of the estate and the surrounding countryside. 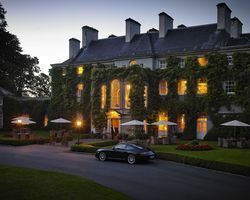 Operating as a luxury hotel since 1989, Mount Juliet House provides the ultimate in luxury accommodation in county Kilkenny. There are 31 individually designed bedrooms, many of which enjoy captivating views over the River Nore and the paddocks of Ballylinch Stud. For the ultimate private party, this house is also available for exclusive use. The Portmarnock Hotel sits on Ireland's stunning east coast, in the heart of Ireland's golfing region. The hotel boasts an internationally acclaimed 18-hole golf course which is considered to be one of Ireland's premier courses. It offers 98 luxurious guest rooms, all elegantly decorated and designed to ensure guest benefit from either sea views or views across the golf course. All rooms offer the facilities needed to ensure guests experience the utmost in luxury. A fitness room and health spa are also available. Druids Glen Golf Resort consists of Druids Glen Golf Course, Druids Heath Golf Course, Woodstock House and the Druids Glen Marriott Hotel & Country Club. 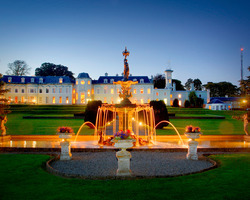 The Resort is ideally located just 30 minutes south of Dublin in County Wicklow, known as the Garden of Ireland. Druids Glen was originally the Woodstock Estate, which dates back to 1600, when it formed part of Sir Thomas Wentworth's landholding. Woodstock House, the clubhouse at Druids Glen, was built in 1770. The opening of the Druids Glen Marriott Hotel & Country Club enables visitors from all over the world to play and stay in a golfer's paradise. The Hotel features 148 luxurious guestrooms complete with swimming pool, leisure & spa facilities and 3 restaurants. Set in lush countryside, and overlooking formal gardens and its own pair of championship golf courses designed by Arnold Palmer, the hotel boasts unrivaled opulence. It is situated only 30 minutes from Dublin City. All suites and guest rooms are individually designed in the grand style, with sumptuous bathrooms, superb amenities and great attention to detail. In addition, both river and coast fishing are available with full health & leisure club and sporting activities.